Every session begins the same way - an email, a questionnaire, some back and forth emails or phone calls and then this beautiful creative process that envelops me. I literally have to slow down for a while, close my eyes, and visualize the location we'll be shooting in. I envision the light, the amount of direction I'll provide, the flow of poses or the way I'll ask them to move to get natural interaction and exchange. I know now that if I just show up at a session without a plan, I walk away feeling defeated, like I missed out on who the family really is - and that's not fair to my clients, my friends. Audrey's family has this warm, relaxed, go anywhere, do anything sort of vibe. They're country folks like us and I was immediately at ease with them. 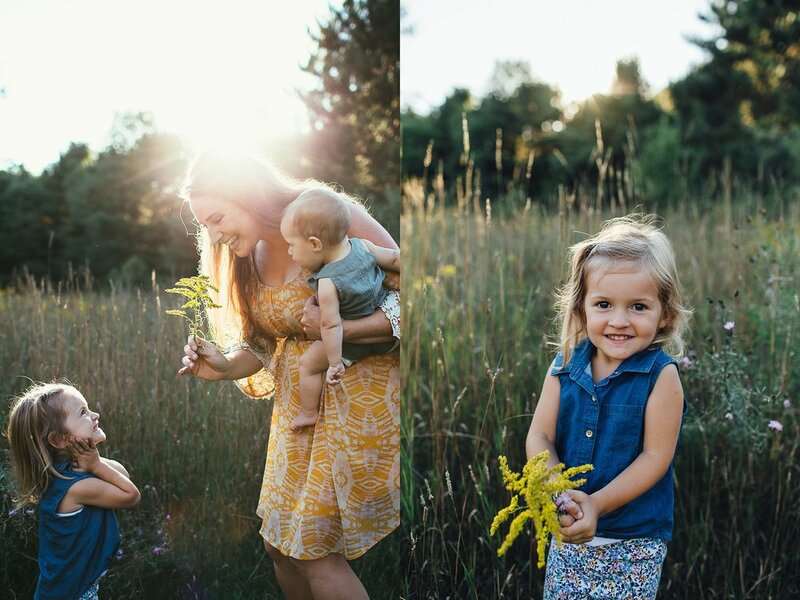 We spent the evening playing in the field and picking wildflowers, and all the while they were snuggling and laughing and bear hugging and soaking eachother up. Enough of me telling you... here's just a sampling of the 142 photos they'll be receiving in their gallery. Enjoy!